Teaching... there are those who think that since they've been through the school system, that they can teach in it. Oh how wrong an assumption. As I switched careers and entered in to teaching full-time, I realised that there was quite the shift from what I remembered what school was like. Mind you, I was looking at school from the perspective of a student, and also as one who's tutored others, as well as taught from that perspective. I came from a rigid mindset of students study and teachers teach, of which teacher's college only began to shift that notion. With all the talk of a Growth Mindset versus a Fixed Mindset in the schools, I thought I'd share some of my insights on this journey of education that I've embarked upon. When I started teaching (it feels like such a long time ago, and to be honest it was over a dozen years now as a public school teacher), the notion of assessing students based upon the Achievement Chart categories was new to me. I've gone through education based upon pure summative assessment reporting. When I taught a stint at a School of Continuing Studies at the local University, I was teaching students that also went through that rigour of tests and assignments. It felt easy... then I stepped in to the public school, and quickly realised and experienced a different set of challenges... ones that pushed at and expanded my boundaries. Over the years, I've come to recognize, acknowledge, and even anticipate the shifting ways in which students are engaged and learn. How many of you have learned something new from the Internet? From YouTube? A well known reference is when Thomas Edison pondered on the future with the emergence of moving pictures, he stated that these would replace text books. For years, this obviously wasn't the case, but with the onset of the Internet, and the copious amount of data being uploaded every minute, students (of all ages) are learning through this medium. Personally, I've learned to crochet through this YouTube postings. A common phrase I've heard these days is it's "no longer about being the sage on the stage, but being a guide on the side"...all the more important, as the plethora of resources on the Internet continues to grow exponentially. When I was introduced to new methods of assessment, terms like scaffolding and "fish bone" charts were the hype. I didn't like the reference to the use of something "dead" as a basis of setting up and planning a course. Instead, I preferred a living analogy, and likened teaching to that of an orchard of trees.  Here the students of the class are represented by the trees, each of which have their own prior learning experiences (the roots), being tended to by the gardener (the teacher) who assesses formative tasks (the leaves) and the summative tasks (the fruit), leading to the ability to judge a tree by the fruit it bears. I came up with this analogy and diagram back in my first year of teaching...years later, I see a Ministry of Education document arise with the title "Growing Success" with images of plants and the supposition that success must be grown. Looks like I was on the right path back in 2002. Another analogy I've come up with is the notion that teachers need to shape curriculum to the needs of the students. In this illustration, curriculum is considered to be a cold block of ice, sitting on top of the students that they are to teach, which are represented by a bed of rocks. The solid curriculum easily touches a few students, which represents the fact that some students easily learn with the information presented to them. The role of the teacher here is to "melt" the curriculum, so that it can encompass every student in the classroom. An engaging educator would then bring the curriculum to life by causing motion which then, over time, can transform and shape the rocks (the students) in the classroom. As an educator, I believe we are called to engage students and to see an impact of education on and in them. Too often I meet people who think that since they've gone through the education system, they can "teach" in the education system. Little do they know how different it is from the teachers' vantage point, and how vastly different the landscape is now, The roles and responsibilities of a teacher have shifted over the years. To be a teacher in this day and age, is to be one that can identify with learners and engage them effectively, to understand that not everyone will learn like they have. Sure there's a need for expertise and experience, which truly enhances the motivation behind the learning, but there's more than just that. Teaching requires passion and the ability to transform concepts in to engaging pedagogy. It is a privilege to be deemed a "teacher" and an honour to be recognized as a "good teacher", one that impacts the community. To all the "teachers" out there... carry on and be encouraged to challenge yourself and those around you. to shape even the most jagged of rocks. Awesome and insightful as well as encouraging! Thx, Eug!